During the last decade, a huge increase in the number of earthquakes striking the Midwest has been reported, especially in Oklahoma. Despite the presence of the New Madrid Fault, historically this part of the country has not been known to produce large numbers of earthquakes. There has been an uptick in earthquakes in Arkansas, and I have been tracking the yearly number of earthquakes in Missouri. The last time I looked, I looked at data through 2016. This post updates the data through 2018. The U.S. Geological Survey database is not categorized by state, so I have been following earthquakes of magnitude 2.0 or greater in a rectangle that approximates Missouri. The precise boundaries are given in the Sources list. Figure 1. Data source: United States Geological Survey. The data are in Figure 1. It shows that the number of earthquakes has continued to increase. The chart forms a rather dramatic spike, with the average number of earthquakes in 2017-18 slightly more than 10 times the average number from 1980-2012. The vast majority of these earthquakes are small. In 2017-18, 12 of the earthquakes were magnitude 3.0 or larger, with the largest topping out at 3.64. The felt intensity of an earthquake depends on several factors, including the type of soil, the distance from your location to the epicenter, the type of ground movement that occurred, and the depth underground at which the earthquake happened. Still, in general, earthquakes below magnitude 2.0 are not commonly felt by people. Earthquakes above magnitude 3.0 are often felt by people, but rarely cause damage. Earthquakes above magnitude 4.0 may cause minor damage. Earthquakes above magnitude 5.0 typically cause moderate damage to vulnerable buildings. It is the earthquakes of magnitude 6.0 and greater that cause severe damage. The Richter Scale is logarithmic; that means that every 1.0 increase represents a 10-fold increase in the energy released by the quake. The earthquakes that caused the tsunamis in Indonesia in 2004 and in Japan in 2011 were magnitude 9.1-9.3 and 6.6, respectively. According to the Missouri Department of Natural Resources, the famous New Madrid Earthquake was actually a series of 3-5 major quakes of magnitude 7.0 or larger, and many several thousand smaller ones. Major earthquakes are also believed to have occurred in southeastern Missouri in the years 300, 900, and 1400 C.E. Figure 2. 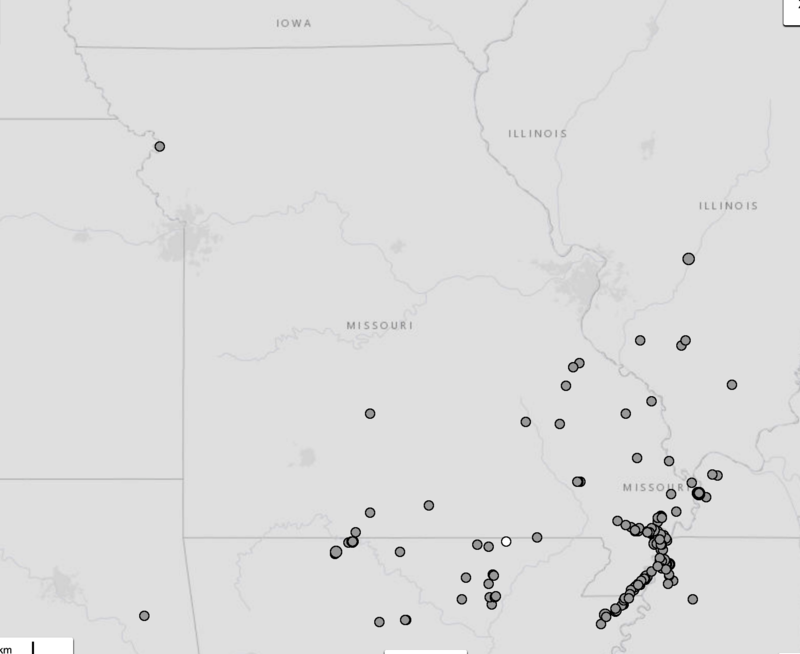 Location of Earthquakes in a Rectangle Approximating Missouri, Magnitude 2.0 or Greater, 2017-18. Data source: United States Geological Survey. Figure 2 is a map showing the location of the earthquakes counted above in 2017-2018. It is easy to see that they cluster along the New Madrid Fault in southeast Missouri. The second largest group extends across northern Arkansas. I don’t know why Missouri is experiencing this increase in small earthquakes. The swarm of earthquakes in Oklahoma has been attributed to the deep well injection of wastewater from fracking, but there is virtually no fracking in Missouri, and Missouri has no deep well waste injection sites. There are fracking operations in Arkansas, but they run through the center of the state from Conway west to Oklahoma. They are not particularly close to the New Madrid area. United States Geological Survey. Search Earthquake Catalog. Data and map retrieved 2/16/2017 from http://earthquake.usgs.gov/earthquakes/search. I searched for minimum magnitude 2.0, no maximum magnitude, starting date 1980-01-01 and ending date 2016-12-31. I searched for earthquakes in a rectangle defined by the following decimal degree coordinates: 40.964 on the north, 35.729 on the south, -95.999 on the west, and -89.099 on the east. Wikipedia. April 2011 Fukushima Earthquake. Viewed online 2/16/2017 at https://en.wikipedia.org/wiki/April_2011_Fukushima_earthquake. Wikipedia. Richter Magnitude Scale. Viewed online 2/16/2017 at https://en.wikipedia.org/wiki/Richter_magnitude_scale. Missouri Department of Natural Resources. 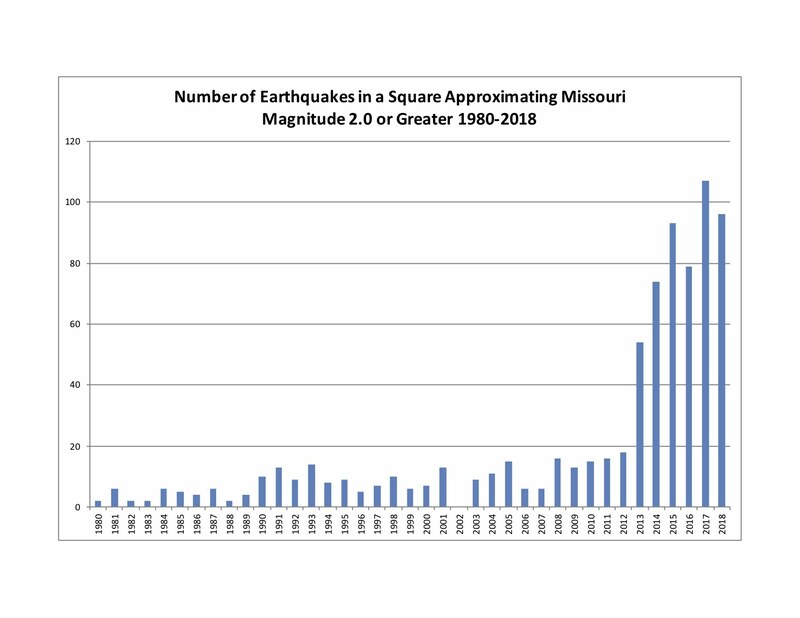 History of Earthquakes in Missouri. Viewed online 2/26/2017 at https://dnr.mo.gov/geology/geosrv/geores/historymoeqs.htm. Wikipedia. 2004 Indian Ocean Earthquake and Tsunami. Viewed online 2/16/2017 at https://en.wikipedia.org/wiki/2004_Indian_Ocean_earthquake_and_tsunami. By mogreenstats in Land, Other Land on 2019/01/24 .